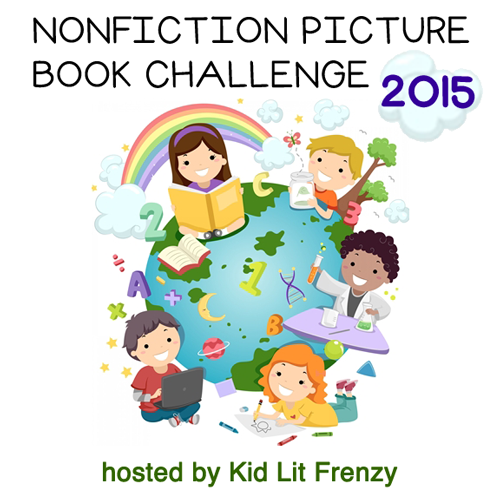 Thanks to Alyson Beecher's Non-Fiction Picture Book Challenge at her blog, Kidlit Frenzy. 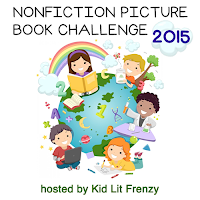 Come read to discover everyone's recent non-fiction picture books. Last week, I shared stories of inspiring people in U.S. history who made a difference for others, and was delighted this week to find another. I'm giving one more shout-out for a book I shared Monday, too. I was in elementary school when the crisis between the British, French, Americans and Russia began, after they divided Germany, especially that Berlin itself was divided, and then no one from the west to get to it. People were starving, no one wanted another war, and so the airlift began. Although we were surprised to imagine that now we were supposed to help these people who were our enemies only a few years previously, we did feel sorry for what was happening. I remember worrying about the kids, and knew they needed food. 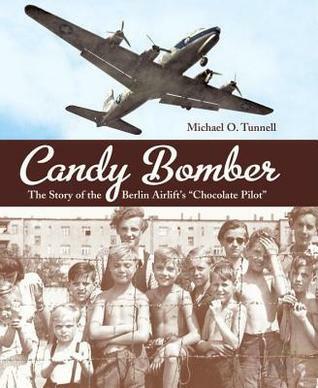 Yet I don't remember anything about this "Chocolate Pilot", named Uncle Wiggly Wings by some, otherwise known as Lt. Gail Halvorsen started with a small bag of candy dropped near the airfield drifting down with a small homemade parachute. Or maybe I've just forgotten. It's an inspiring story, a good one for middle grade readers who are interested in post-World War II history. The number of pounds of food and supplies airlifted into Berlin is staggering, and when the candy drops began, people started donating lots and lots of candy and fabric for parachutes. When Halvorsen saw a group of kids outside the fence at the airfield, he walked over to talk with them, saw their wistfulness, and only had two sticks of gum to give. He was amazed to see that everyone agreed on the four who would get the four halves, but the paper was passed around so the kids could all smell it. Thus began his plan, to drop a bag of candy the "next" time. The kids asked how they would recognize his plane. He said he would "wiggle" the wings. Thus began an amazing effort by many to offer hope to children in crisis in the form of candy. There is more, with pictures, of war-torn Berlin, children, the servicemen who flew flight after flight until the blockade ended. And the following years, after more years, Halvorsen continued to help with other needs, like in Kosovo during that crisis, and commemorations of the original airlifts. The story will be historically interesting to those who are studying the Cold War, and how that old cliche still tells the truth: "Little things mean a lot." I also need to share, if you haven't already seen my Monday post, another non-fiction book written by a former student at my school and her husband: Find Me Unafraid, by Kennedy Odede and Jessica Posner. 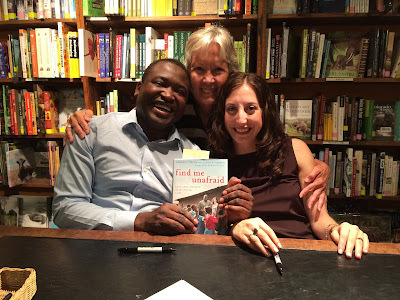 They're on a book tour across the US, and were here in Denver last night. It was great to see them, and to visit with many former students and parents. I reviewed the book on Goodreads if you'd like to see the review and those from others! They are already talking "movie"! It continues to astonish me how much there is still to learn about facets of WWII history through the stories of people involved. Thanks, Linda. I loved reading about the details of this, Teresa, & only knew about some of it from newspapers and my family telling me. Great story! Thank you for introducing me to what look like 2 great reads! I have been so busy, too, but not with anything bad, just a mishmash of things, Carol. I know about your twitter hack, & did follow your new account, just shared today's celebrations with you, & am starting to read everyone's. Thanks for dropping by! The book was very interesting!